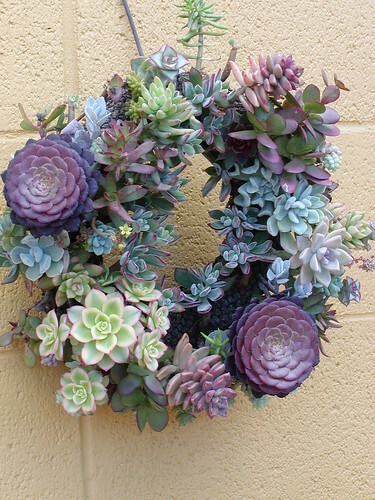 Well… as I was taking in the beauty and intricacies of each little plant and trying to find a way that I could use them in my home decor, I came to the conclusion that it is time for me to try my hand at creating my own living wreath! 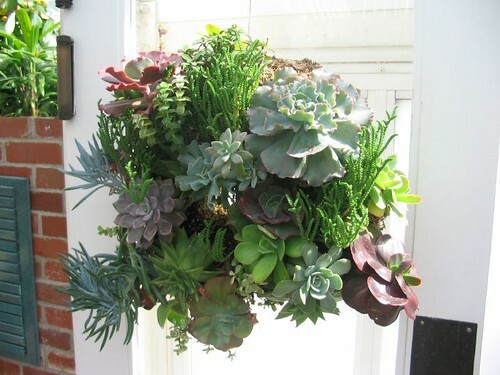 Because you build a living wreath out of different cuttings and not whole plants, it won’t be extremely expensive to create. I will be very careful to buy only those plants that will produce several cuttings for me to work with, which will also help to keep my costs at a minimum. The types of plants, shapes, colors and sizes that you choose to work with are all up to you & your particular tastes, so you will be able to create something that you will truly love & enjoy for years to come! Soon, as your living wreath begins to grow, you will be able to take cuttings, which you can then share with a friend, or use to create new wreaths to give away as gifts! 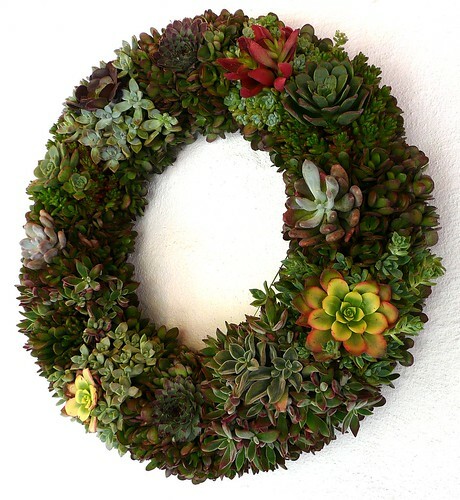 Here are a few pictures to help give you some ideas on how to create your own living wreath. 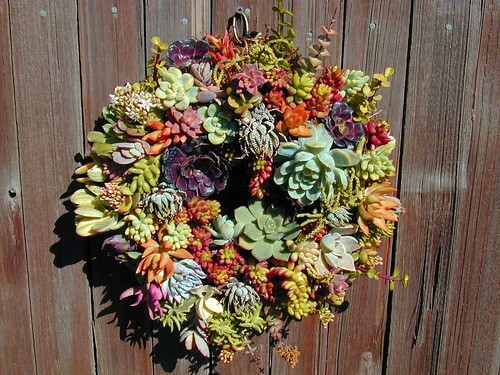 What is your biggest question about creating your own living wreath? Post it in the comments below, and we will try to answer it for you! This week I made a stop at my local Lowe’s garden center. I try to stop in frequently throughout the summer, because there are always so many unadvertised specials to be found! While I was there this week, I overheard a sales person talking with a customer, trying to explain the over abundance of plant material. She said – they have a contract with a large wholesaler, and they receive a certain number of plants whether they need them or not. This usually means that they have way to many plants & need to mark them down – or else they will risk loosing the plants due to lack of proper space & care. There is almost always a rack of plant mark downs when I stop in. I routinely find deals of 50-% – 75% off! I am so thrilled with my latest finds! 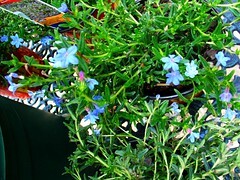 It flowers in May & June, only gets approx 6″ high, and is one of the best blue flowering ground covers available! This little beauty is a wonderful option for; ground covers, rock gardens, spilling over walls, hanging baskets, or edging your flower garden borders. I think this plant would look wonderful with the white version of this plant which is called “‘White Swan”. I think I might also mix mine with some ajuga. I was VERY excited to find this Longwood Wisteria plant with a few flowers already on it, especially when some types of wisteria plants can take up to 7-10 years to bloom! They like to grow in sun or partial shade, and can reach 20 – 30 feet tall! 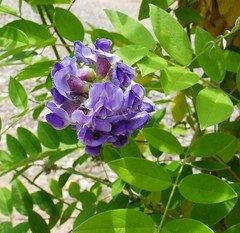 It will grow in zones 5-9, and I was surprised to find out that this particular wisteria is a US native! Although this plant blooms from late spring to early summer, there are also reports of this beauty showing off again right through September! This is a quick, easy, cheap, come back for seconds family dish! Pasta salad is the perfect side dish for any summer meal! You can also change the recipe very easily by tossing in any of your favorite ingredients right from the cottage garden! While your pasta is cooking, mix together the following ingredients & let sit until pasta is done. I know your family will enjoy this one! I also wanted to share some of the newest guests to our bird feeder with you! 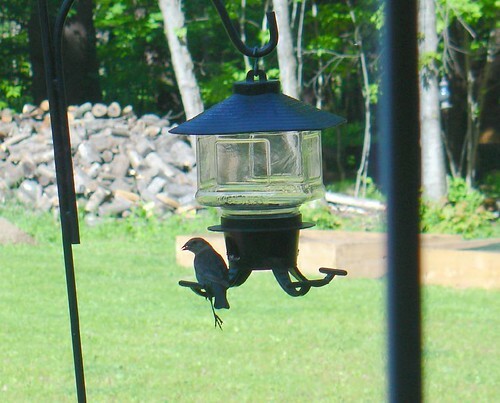 The Bird Feeder – A Hot Spot in Our Garden! I’m talking, of course, about our bird feeders! I thought I’d share a few pictures of the recent guests to the cottage feeder. The first up (one pictured above) are the wonderful finches! They come in so many colors & sizes – but most of all – they have the most beautiful songs! Then there are the little guys like this little chipmunk! So cute & tiny – we love to watch them stuff their cheeks full of goods then run back under the trees! And last of all… the bigger guys like this sneaky raccoon! 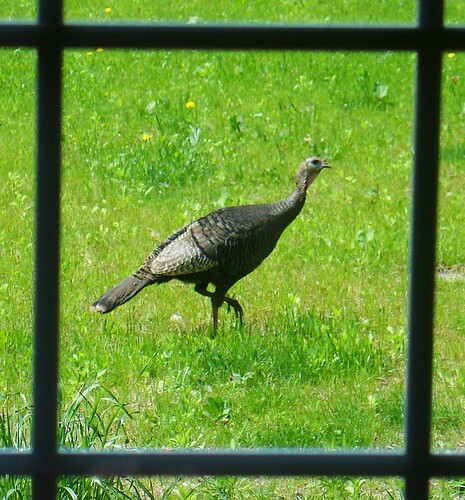 I do love wildlife… but I hope this is as big as the visitors get! After all… there were a few bear sightings in our area last year – yikes! * Did you know that raccoons have “thumbs” which is why they are able to open trash can lids, and get into lots of other trouble around your property?! I want to thank Manuela at The Feathered Nest for choosing me to receive the Thinking Blogger Award! She has a great blog – take a minute to go over for a visit! Once you’ve received this award, you are supposed to pick a few of your favorite blogs to give the award to. Here are just a few of my favorites. Deb shares tidbits of her families daily life on the farm. 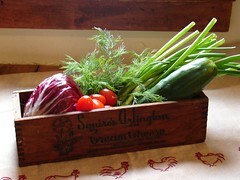 The posts are filled with ideas about recipes, crafting, gardening, and life in general. Donna shares lots of wonderful home decorating ideas. You’ll find lots of inspiration at this great site! I think you’ll love Kim’s little cottage… I know I do! She has a great eye for color & design. You’ll love reading her posts that cover many of her different interests. Read about life in Somorset (in the UK). This site is filled with wonderful pictures & ideas, gardening, and decorating ideas. The new issue of “A Storybook Life” is out now! Once you subscribe, you will get an email with this month’s newsletter inside. Elegant Easter Eggs – Your little masterpiece will be the talk of the hunt! You can Have a Beautiful Cottage Garden Even in a Temporary Space! Interesting Things You’ve Got to See – Pearl’s April Picks!